Eager to finish today’s run and get to our rest day, we left the river camp early and said good-bye to Rasta man who ran the camp. The morning was fresh after last night’s rain. We drove the 5 kilometers back on the road to the point where I had finished the previous day’s run. Kebba and I set off quickly, determined to leave the dirt road behind and to benefit from the cooler temperatures. When we reached the end of the dirt road and the river camp, Rasta man was standing on the bridge, cheering us on and wishing us well for the rest of the journey. Right after the bridge, we stopped at the military check point to say hello to the soldiers. I asked them a few questions about the Gambian military and learned that they are often part of the UN’s Peace Keeping Forces. I told them that it had been Canadian Prime Minister Lester B. Pearson who had come up with the concept of peace keeping. All three of the young man I was speaking to had done a tour in Darfur. We took some photos together for which they hid their large rifles behind a tree and then we were off again. Working hard on the dirt road. I don’t usually run with music, but today I took out my iPod to listen to some tunes instead of the frog concerts, bird calls, bleating of the goats and braying of the donkeys. Instead, the Talking Heads, Nirvana, Red Hot Chilli Peppers, Miriam Makeba and the entire Drakensberg Boys Choir singing Shosholoza (a song very dear to South Africans and Comrades runners from around the world) were my companions. Kebba was also listening to music on his cell phone. So many children in the Gambia need your help! I noticed a car pulling up beside me and turned my head in surprise, as Pa Modou was ahead of us in the support vehicle. It turned out to be Ongul, Oumie and the Nova Scotia volunteers Katie, Lauren, Pam and Stephanie. They had finished teaching the peer health education courses in the schools they had targeted and were now on their way back to Banjul to start their placements in hospitals. It was great to see them! We got caught up on the latest news and then they joined me in the run for a few hundred meters. Lauren challenged to a sprint and Kebba and I took the bait. Don’t ask me where we found the energy – maybe the thought that tomorrow was a day off after six straight days of running over 30 kilometers was helping. Or maybe it was the spirit of support from the extended team. By now we were more than half way through today’s run and Spider had also joined Kebba and I now. We occasionally stopped to shake hands and speak to people and I earned a new nickname today. The first time someone called me this new name was at the river camp, when Rasta man said I had the strength of a lion. One of the soldiers at the military check point also said I was a lion (he had told me as well that he would like me to carry his family name – not sure if as his sister or his wife!). And a woman we met at one of the villages referred to me as a lion as well. Anyone who knows how much I admire the big, graceful cats will know how flattered I was. The guys are always there to support me! Near the end of today’s run, we reached another military check point. This one actually stopped us whereas we usually just get waived through any control point, whether military or police. Our vehicle has an NGO license plate and these type of organizations do not give bribes as a matter of principle. This soldier wanted to check the back of our vehicle, so we opened it up while telling our story. He was intrigued by the fact that we were running such a long distance and I assured him that as a result, all he’d find in the back of our car was smelly shoes and dirty running socks. He smiled and said all was well and we talked a little more about our run and he saluted me three times while we spoke. Then I got a final crisp military salute and smile as a good-bye. 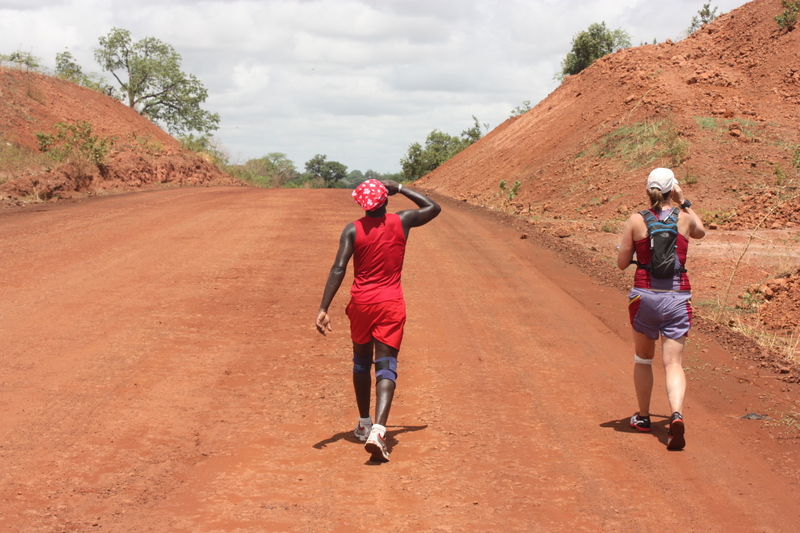 Now only a few kilometres remained and we were going to finish the day in Kebba’s home town. Kebba had run nearly the entire day with me today and was proud to be running at home, waving at friends and relatives as we went through town. We finished our day at the far edge of town after 32.2 kilometers. Another great day! Then we went by Kebba’s sister’s house for a quick visit. She had prepared some delicious domodah and shrimps and chips for us. We played with the adorable kids in the yard for a while, chasing each other around. The little ones loved their dinosaur stickers and all had some stuck on their arms and clothing, showing them off proudly. The girl in her school uniform received a pencil instead and was happy with the gift. These kids were so playful and absolutely adorable. I hope we’ll have a chance to see them again tomorrow. Enjoying a well deserved rest. Next it was time to find accommodation. The first place we tried did not have power at all, so we went to look at something else, especially since we were going to spend two nights. The second place we investigated also didn’t work out, so the guys decided we’d drive back along the road for a short stretch to the village where the Gambian President was born and raised. At the edge of the village was a resort. I was in for a major treat! The place has power, air condition, Wi-Fi, a shower with real water pressure and – get this – a swimming pool!! I had landed in the lap of luxury! It wasn’t just the team who arrived at Sindola Safari Lodge, but we were plus one. Pa Modou had spotted a small turtle on the road as we were driving towards the resort. The poor thing was at risk of getting run over by a car. So we stopped and I wanted to put it to the side of the road, but Kebba suggested we take it along. I picked it up and climbed back into the car. The little turtle had receded into its shell and had covered its face with its front legs in a “if I can’t see you, you can’t see me” fashion. I kept it on my outstretched palm and as we were driving, it got up enough courage to sneak a peek at me and then to slowly come out of its shell. When we arrived at Sindola, I walked up to the reception desk (none of the places we had stayed before had such a thing!) and sat the turtle down on the desk while I completed the required paperwork. Kebba suggested I take it to my room and keep it over night to keep me company, but I thought it should be set free. So I took it to a small pond in the nicely landscaped garden and sat it down in the grass. The gardener was nearby and saw us and he suggested they mark the turtle with a splash of paint on its shell in order for it to be recognizable as the one I had brought who would now have a home at Sindola. And so it was done. 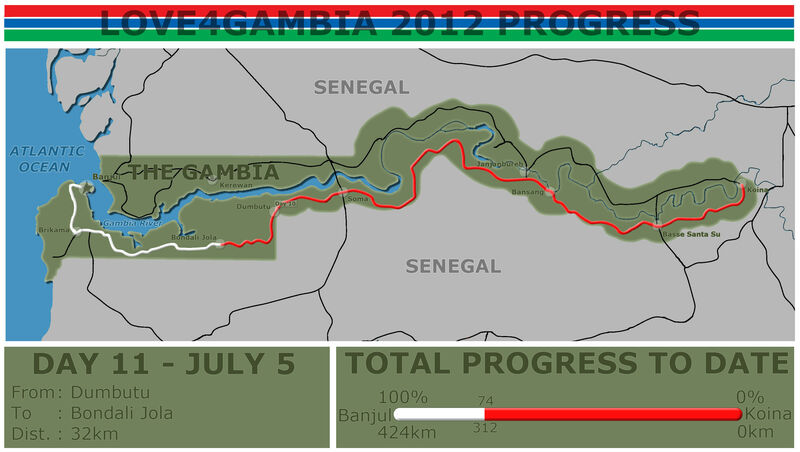 We named it L4G, as in Love4Gambia, and it is now happily enjoying its new home. The guys left shortly after settling me in and I headed over to the bar by the pool to sit on the deck and take advantage of the Wi-Fi. As I was checking messages and enjoying a cold cola, a group of young Gambian girls arrived. They were not guests at the hotel, but had purchased access to the pool for 50 dallasis each. All of them were dressed up, wore make-up and long wigs or had their hair done in an elaborate fashion. They headed past me to the pool and stripped down to their underwear, as they did not have swim suits. When they took the steps down into the pool they realized it was fairly deep and none of them could swim. So they splashed around on the steps for a short time and then called out to me: “Hey, sister, come in here and teach us how to swim!”. I had been planning to take a dip in the cool water to soothe my legs, so I gladly accepted the invitation. I told them I had to change into my swim suit and when I re-emerged from my room in a bikini, I received a round of applause and cheers. I got into the water and the swimming lesson began right away. First I showed them how to move their arms for the breast stroke, emphasizing the need to push water behind them with their arms. They moved their arms as I showed them. Next, we held on to the edge of the pool and I demonstrated how to move the legs in a frog kick. Again, they mimicked the motion. Now it was time to put the two together and the two girls named Fatou, the most eager students, tried to swim from one end of the steps to the other. Good try! We practiced some more along the edge of the pool and then Fatou 1 ordered me to stand deeper into the pool and announced she was going to swim towards me. There was no life guard on duty, so I was it. My chin barely reached above the water level, but I was on solid ground, so we counted to three and Fatou paddled off, her face in the water, arms and legs flailing. When she reached me, I grabbed her and pulled her up. We high fived each other and she was pleased as punch. Fatou 2 was just slightly less comfortable, but she also reached me and again we pumped our fists into the air to underscore her success. The girls’ mascara was running down their cheeks and the nicely styled hair was soaked. After more practice and adding the crawl, Fatou 1 managed to swim a length across the pool. One of her friends had documented the entire lesson from the edge of the pool with a point and shoot camera. After our swimming lessons, we got to know each other better. I learned that all the girls were in their mid-20s. Fatou 1 and 2 both had children, but were single mothers. 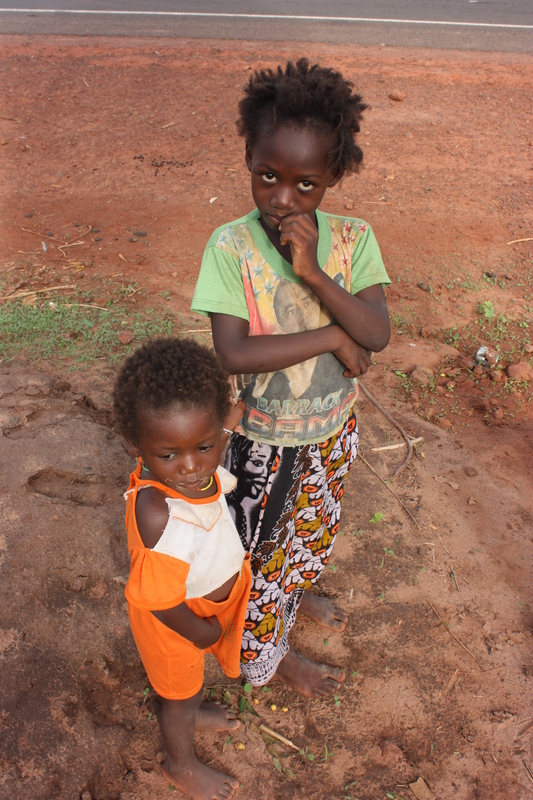 They live in Serakunda, near Banjul, and were in town to visit one of the girls’ sisters. We also talked about my run and they asked if I was a sports woman, a question I frequently get. Then they saw my injured knee and the horrible state of my feet and said: “Oh, sorry, sorry!” and fussed over me a bit. While my feet were a mess, my French manicure was a hit, however (thanks, Alexis!). Fatou 1 works in a beauty salon in Serrakunda and when I said that I had broken a few finger nails during my journey, she told me to come by before leaving for Europe and she would fix my hair and my nails “real nice”. Sounds great! I took her number and will pay her a visit when I go to explore the Serrakunda market. After the girls left, I relaxed by the bar for a while and now it is time to go to bed. 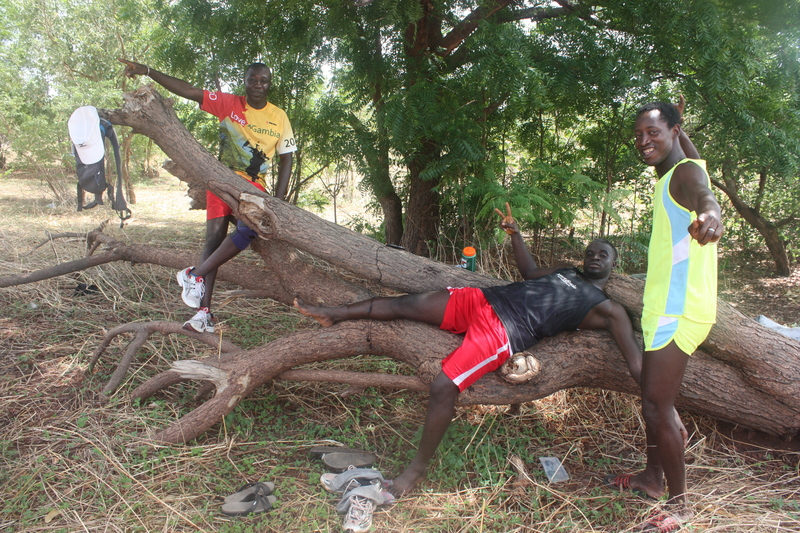 No need to set the alarm for tomorrow, as it is our second and last rest day before the final push to Banjul. We have covered over 300 kilometers now and we can hear the call of the Atlantic Ocean. But before then, I think the swimming pool will be calling a few more times! Best from the President’s home town! This entry was posted in Charity Run and tagged Africa, chil, children, Gambia, Music, NSGA, The Gambia. Bookmark the permalink. 7 Responses to Day 11 July 5 – Made it through a big week! Lioness Bintou, I love that you have progressed to being a swimming instructor! Won’t Ken Grandy be proud!! 🙂 Much love! So glad you found a pool. Sounds like you and the turtle found your oasis for the day! Enjoy your rest and pamper yourself. Soon you will be able to smell the ocean! Andrea you are doing incredibly well, it is so inspriring to follow you. I sit on the Board of the NSGA and we spent a lot of time at our Tuesday Board meeting recounting your run to date. We are so thankful that there are people like you in this world. You are amazing. She is Andrea!! – Hear Her Roar!